Every morning we hike at sunrise to watch the sun lift in the east and light up the Flat Irons in the west. The path is full of river stones and rocks. And at this one, I stop and say hello -- for it seems to me a perfect description of my working life: weaving, writing, and knitting. 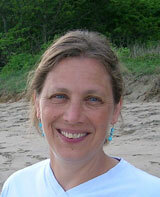 And I think, yes, even broken into three fragments, it is still whole. I first published this post some seven years ago and decided it seemed as apt and revelent today as it did all those years ago. Perhaps even more so as I have undertaken a new art in addition to the one that has served me well for many years. Making the rounds these days in a "moveable feast" are posts from fellow authors and artists** on why they blog (with a universal plea for someone to coin a more elegant word for what we all do). So I thought I would add my own thoughts to the feast. I blog because I am a collector, a magpie attracted to shiny things -- not all of them beautiful, but for some reason of interest. In the old days, I kept notebooks with photocopied images, postcards, and lots of little baskets filled with peculiar objects that had no function other than that they were interesting to my magpie brain and I couldn't bring myself to clean them out. I built a sizable bower around my desk of stuff (and looking at Terri's terrific series on people's desks and work spaces, I see I am not alone in this nesting habit!). But the internet is a huge forest of shiny things, of images, of people and places I might never have found on my own in the material world. So I have shifted my acquisitive self from the cluttered realm of my desk to the endless capacity of my desktop. Over the last three years (*now eleven years!) I have used the blog to keep together all the treasures I have found and from this internet bower, share them with others. 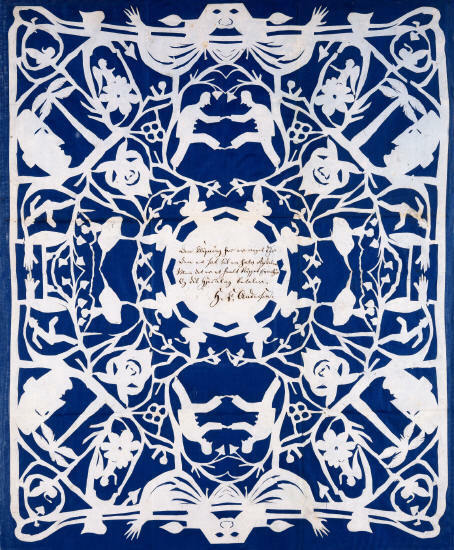 Some posts and images are personal -- a copy of my father's name on a document at Ellis Island, the textiles produced by the women of my family, my grandfather's paintings, my garden. Some are quirky, like Samurai armor for dogs, vintage Mexican Paper Dolls, and my great grandmother's calling cards. Some posts have brought gifts, which I have re-gifted, such as the disk of 700 photos from Pinky Werner of Madrid, NM where my grandfather briefly worked, and which over the last two years has generated a renewed interest in the old mining town, especially among the descendants whose relatives once lived there. (Pinky's photographs remain to date one of the best visual records of Madrid and I have had the pleasure of not only sharing them on my blog, but donating copies of the disk to former residents, graduate students, and art institutions -- insuring for the future the history of the town.) Through posts on my grandfather, I was "discovered" by a maternal cousin Earl (another magpie!) and with his help I have been able at long last to fill in the complicated backstory of my mother's family. So there it is -- I keep my treasures in front of me on the blog, sharing them with anyone who is interested..and delighting when they are. Nothing is lost -- I can use the search function to find an item from long ago (would that I could do that with my filing cabinet!). And I blog, because really, it's easier than having to clean my desk. Art: Rubans Peale "Magpie and Cake," Toshi Yoshida, "Plum Tree and Blue Magpie," Eduoard Travies, "Magpie." I found these beauties sorting through yet another still-packed box in the garage. I was given these Mexican paper dolls when I was quite young and have fond memories of spending hours studying their regional costumes. One folded the arms behind the back, creating a cone shaped figure and then slid the ends of the shawls into a slot in the front of the dress (see last picture). I always played with them unfolded however, because one could see more of the clothes and I loved the details of their dress. I have scanned all fifteen of them and created a gallery for them, which you can find in the right sidebar. Perhaps this year I will finally find a way to frame them altogether. 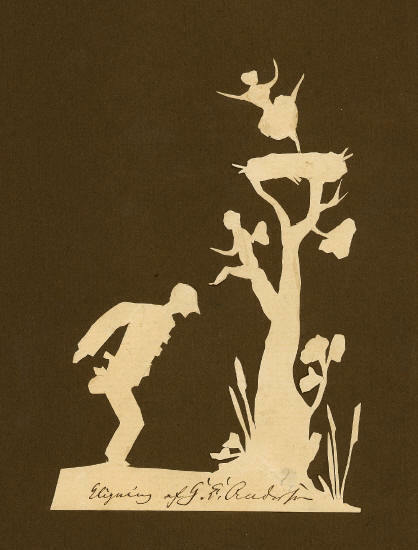 As it turns out, Hans Christian Andersen produced really wonderful, whimsical, and beautiful papercuts when he told stories. He also produced lovely Christmas ornaments out of colored paper. I always think of his melancholy fairy tales -- and was surprised by the humor and quirkiness of these delicate pieces. Happily, you can see a lot more of them t the Digital Library of the Odense City Museum. 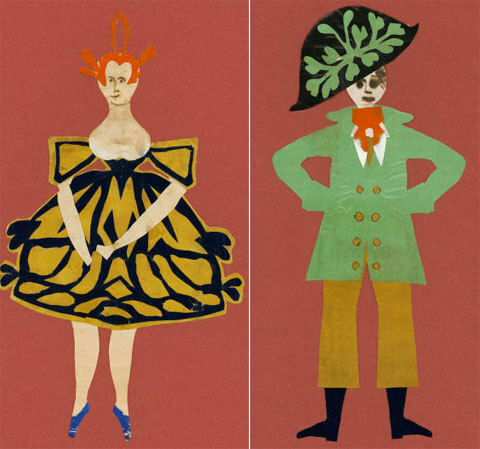 The images above are two Christmas ornaments while the images below are examples of his fairy tale scenes and complex folded paper cuts.